Making red wine is an ancient craft. Although the wine making equipment may have changed and scientific knowledge increased, the basic steps have remained the same, and that's regardless of whether the red wine is an everyday plonk or a sensuous, full-bodied prize-winner. While soil and the weather affect the grapes, for a large part, what makes the difference, what changes it from being a production to a creation, is the art of the winemaker. A winemaker must have many skills, one of which is the ability to judge the right time to harvest the grapes. They need to have the right balance of acid and sugar and these factors can even change depending on the time of day. When the moment is right, the grapes are carefully gathered ready for step 2. Once harvested the grapes are put through a machine that strips them from the stem while gently crushing them. This first crushing exposes the juices to the yeast naturally present on the skin. Leaving the stems in will results in a more tannic quality to the wine. The ‘must’ that has been produced is now placed in a fermentation vat. These days this is most likely to be made of stainless steel, glass or plastic. Yeast is added to the must and this converts the sugar in the grapes, over a period of about 4 weeks, into alcohol. During this process the carbon dioxide that is produced pushes the grape skins to the top of the vat. Several times a day this ‘cap’ as it is called, must be pushed back down so more tannin and colour can be leeched from the skins. The length of this first fermentation depends on the judgement of the winemaker. If it’s too short a time the resulting wine will be thin, lightly coloured and tasteless; too long a fermentation and it will be bitter. Now it’s time for the wine to have its first pressing. 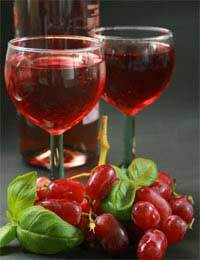 The first juices that run off before pressing begins are reserved for the best quality wine. The rest of the must is pressed to extract the remaining juice. Again the winemaker’s skill is important: if the must is pressed too hard or too often a poor quality wine will result. The purpose of fermentation is to transform the sugar naturally occurring in the grapes into alcohol. At the end of the first fermentation, some sugar will remain so a further fermentation is needed. This time though fermentation locks are used to stop oxygen getting in but to allow carbon dioxide to escape. Often during the second fermentation process a malo-lactic bacteria is added. This converts malic acid in the wine into lactic acid, converting sharp into mild. At least once during the second fermentation the wine is carefully siphoned from one container to another. This allows any solids that remain in the wine to be left behind. Wine is transferred to oak barrels (or stainless steel vats containing oak chips) and left to mature for anything from 9 months to 3 years. When the winemaker is satisfied that the wine is good and ready, it’s time for bottling but first there is one more step. So that the final wine will be as clear as possible, it may be treated with a fining agent and filtered before bottling. It’s then carefully bottled – making sure the wine doesn’t come into contact with the air - before being stored again for a length of time that will depend on the quality of the finished wine. Wineries will store fine wine sometimes for several years before selling.